Need an indoor plant for your office desk or home but tired of your plants dying quickly? 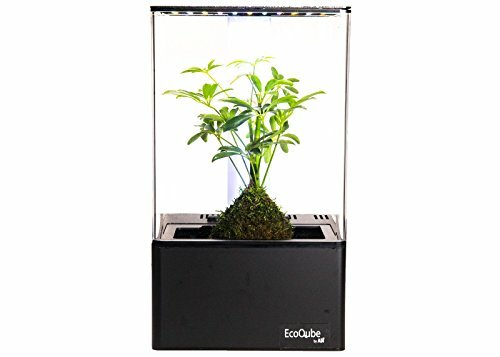 The EcoQube Air is the solution for every person who has ever loved the look of indoor plants or herb gardens, but has always struggled to keep them alive! Growing plants indoors can be a real challenge because of sunlight or seasonal restrictions, but the EcoQube Air solves that problem! No direct sunlight needed - the full-spectrum LED light is programmed to give your plants the exact amount of light it needs to grow. Smart Light Therapy Makes You Feel Better! Sunlight dictates your circadian rhythm, which directs our body’s biological clock and tells you when to sleep and when to be awake. UV Filter - takes air purification to the next level, killing harmful microbes and preventing algae growth. There are plenty of beautiful aquariums, terrariums, and home gardens out there, but what do they DO for you? The EcoQube Air combines aesthetically pleasing design with function to naturally improve your environment and your quality of life. The cost of individual products such as plants, pots, maintenance, and air purifiers add up quickly, but one EcoQube Air solves all these needs at a fraction of the cost. We back our product with an ironclad satisfaction guarantee where if anything breaks in the first year, contact us and we will replace the part. NO MORE DEAD PLANTS - Waters indoor garden kit herbs Automatically to grow in any season in your home. Plant up to 5 herbs. BEAUTIFUL INDOOR DECOR - The EcoQube Air's modern look is a perfect futuristic decor addition to any office or home. PREMIUM VERSION COMES WITH UV FILTERS - The True Hepa-Type UV filter guards against germs and are perfect purifiers! If you have any questions about this product by EcoQube, contact us by completing and submitting the form below. If you are looking for a specif part number, please include it with your message.